Forrestdale darts players Jordan Nissen, Jordan Harper, Sean Cole, Zac Harper and Dylan Wilson with the under 18 trophy they won. 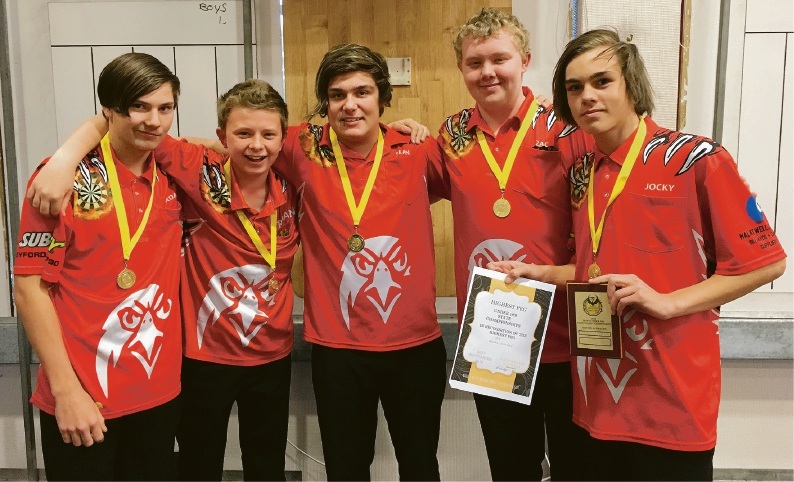 FIVE eagle-eyed teenagers from the Forrestdale Darts Club have won the State under 18 darts competition. It was the first time the players – Jordan Nissen, Jordan Harper, Sean Cole, Zac Harper and Dylan Wilson – representing the Forrestdale Sporting Association and the Forrestdale Falcons, had taken part in a serious competition. About 100 players from around WA took part in the Darts Western Australia competition earlier this month with the Forrestdale boys winning gold following a courageous and determined effort. Three of the boys – Jordan Nissen, Dylan and Sean – were among 10 players selected by Darts WA to try out for the under 18 squad that will represent WA in Geelong in January. Dylan made the final cut and was one of only four players to make the State team.